This game is often referred to by many different names but finally the company that makes the machine has added the name to the top. It now says Shoot to Win Craps. I have found that these machines although they look the exact same, can actually be very different. Just like a slot machine they can be programmed to give the player different odds. They all play the same as far as the Shooting of the Dice is concerned. 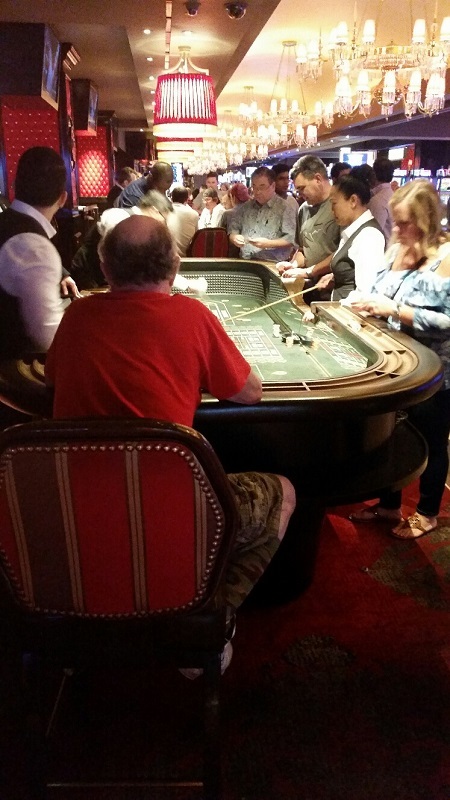 The shooter has a red button that He/She hits and this makes the dice pop in the air, making for a true random outcome that would be similar to a traditional Craps table. But many machines are different in the minimum You must play per roll and more importantly the odds that You can take. For instance; At New York New York, You can play 2 dollars per roll and take double that amount on Your odds. But at Casino Royale when You take the same minimum of 2 dollars, You can put 5x Your odds, so on a 2 dollar pass line bet You can play 10 dollar odds at Casino Royal but only 4 dollars at New York New York. 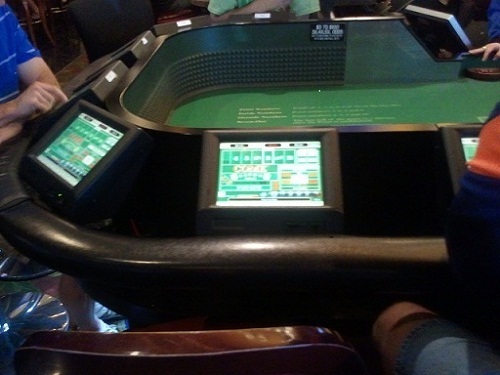 If You do not use the odds line or You play the field or make place bets this will not mean anything to You and You can play all the machines the exact same way. The only difference to You would be the minimum bet. Plenty of these machines all over Vegas are misleading as to what the minimum is. You might see on the display that the minimum is one dollar when in fact it is 5 dollars. When You put Your money in and select one dollar and try to place it on the pass line it turns into 5 dollars and that is the only way You can find out what the real minimum is. At the Cromwell, They have covered this by putting a very easy to see sign that says minimum is 3 dollars even though the display says 1 dollar. So far I have not seen ANY machine stating what You are allowed to play for the odds so that is something You have to find out as You play. The best strategy in playing this game is to always get the most odds that You can. You might wonder why You have not gotten the rewards that You think You deserve for Your play on this machine. There is a good reason for this. 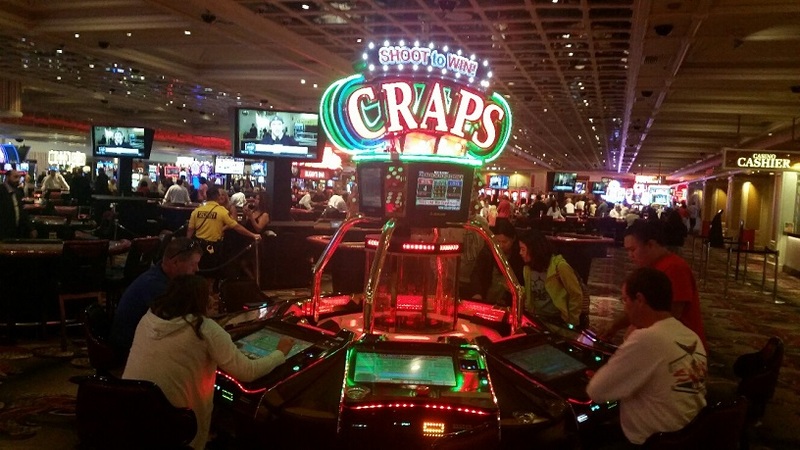 Even though the traditional craps table offers You a better chance to win than does this machine, the Casino will reward You more on the table than the machine. 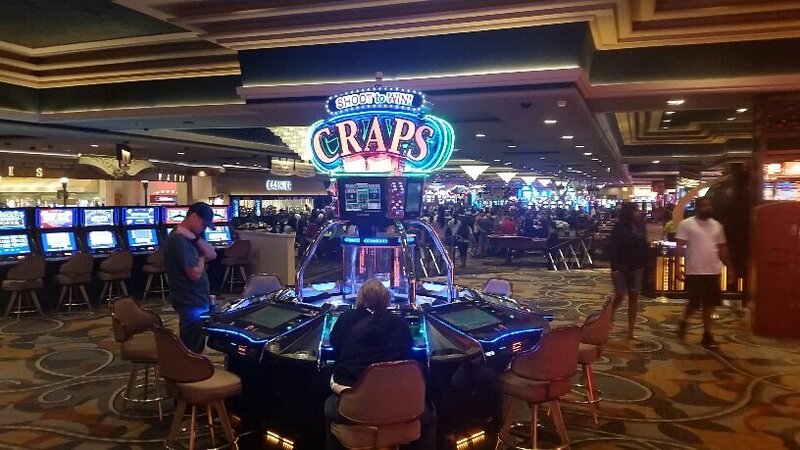 This is because the Casino does not own the Craps Machine. 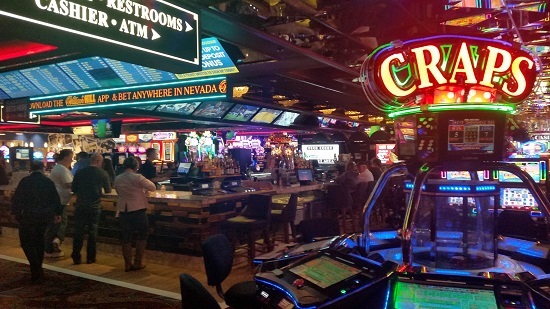 The Machines are very expensive, more than 100,000 dollars each so the Casinos allow a third party company to put the machines in the Casino and give them a commission. 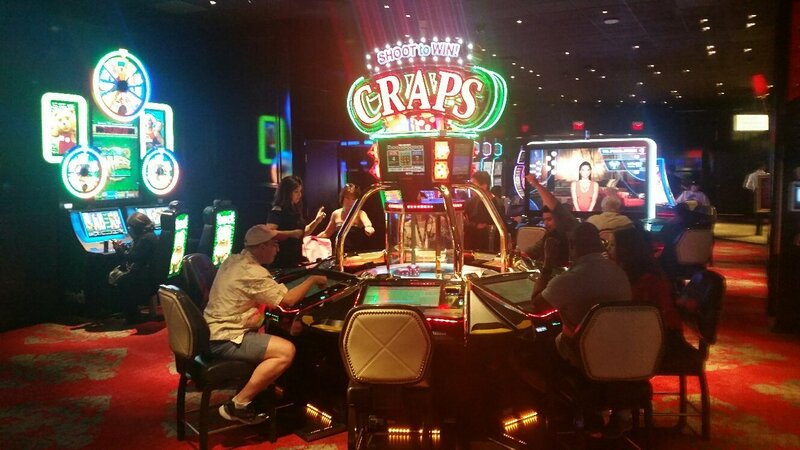 This way the Casino has no risk but has much less upside as it has on a traditional Craps Table. The rewards You get from playing this machine will be anywhere from zero to about 10 percent of what a slot machine will give You. 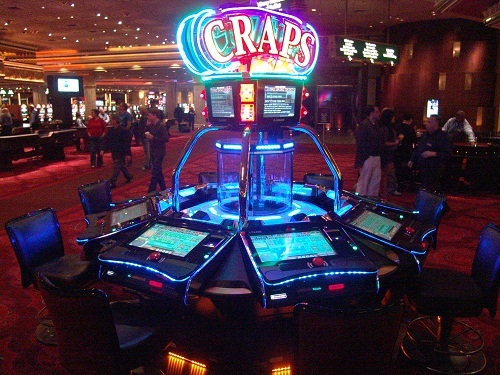 Each Casino is different in how it rewards You but all are returning much less on this machine than table games or slot machines. Wait for a point to be made or a 7 so there is a "new game" to be started. Place Your bet on the pass line. If a 7 or 11 is shot, You win, if a 2,3 or 12 is shot, You lose. Any other number becomes "The point" Then You need that number to be shot before a 7 is shot. If the point is shot You win an equal amount to Your bet, if the 7 is shot before Your number then You lose and it is time to put another bet on the pass line and the process starts over. That is the most simple way to play but to decrease the house advantage, You should take Your odds and this amount varies depending on the machine You are playing on. You take Your odds after a point is established. For example, an 8 is shot and becomes the point, touch the area below Your pass line bet and a window opens up giving You the chance to place Your odds, it might let You take 2x Your original bet or it might let You take as much as 5x that amount. The more You take the better Your position is against the Machine. You get paid on the odds line depending on the number that is the point. The reason You should take Your odds is on this bet You have exactly equal chance as the Casino. Place bets: These are great bets because You can pick the number You like without having to go through the pass line method. As You can see the place bet pays slightly less than true odds but You have the advantage of choosing the number, the more likely the number to be rolled the less return for You. The 4 and 10 are the most unlikely but You get paid much more when it does come in. To make this bet just push on the number directly on the screen, a window will pop up, click on the place bet box until the amount of the bet is correct, close window. The field bet: This is a one roll bet and is spelled out very simply on the screen. It seems like a great bet because there are plenty of numbers that You will be paid for. The reason it is not a good bet is that the three most common numbers are missing: 6,7,8 but the bet is still better than most casino advantages (like slot machines). Click on the field to make a window pop up, select the amount You want to bet, close window. 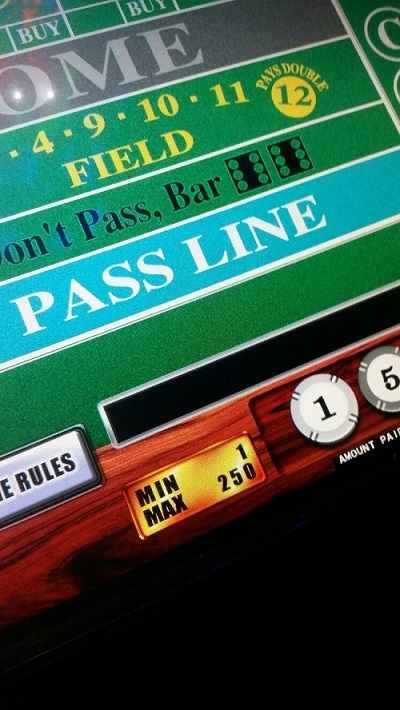 The come bet: The come bet is exactly like the pass line bet except it can be played any time and starts a new game within the game. You can keep betting the come bet and start a new game EVERY roll. This is advanced and You need to really be paying attention because the game goes fast when playing this bet. After every roll, You will be able to take Your odds so You must act quickly to take the odds and still get a new come bet out. I do not recommend doing this unless You are seasoned and are not drinking heavily or if You are not with a group of talkers. To make this bet click directly in the area that says come bet, select come bet and the amount then click close window. hard way bets do not come down until a soft version of that number is hit. For instance; if You play hard 6, You keep that bet until a hard six (2 x 3) comes up or soft 6 comes up (5 and 1, 4 and 2) or a 7. The reason You get paid so well is because You can lose many different ways and can only win ONE way. to make this bet click directly on the bet on the screen then Your amount to be bet, then close window. Other bets: The other bets are high paying on low percentage numbers and are one roll bets. Like 11, 2 or 3. The machine has a huge advantage but it's not a stupid bet if You win, right? In the Video below You can see what the dice look like as the player shoots by pressing the red button. A Five is rolled and becomes the point. 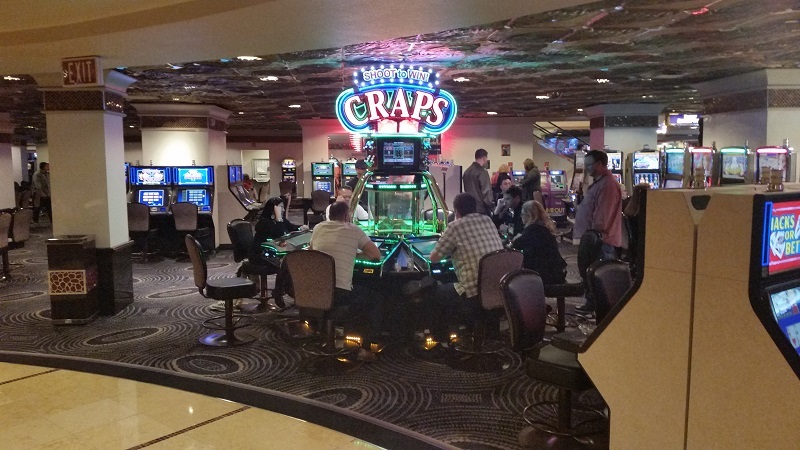 If You play the Shoot to Win Craps just because You want to to sit instead of stand, You should know that You CAN sit while playing at a traditional Craps table. Just ask one of the dealers for a bar stool or pull it up Yourself. The minimum bet is often displayed incorrectly on the shoot to win machines. Many say 1 is the min but none are that low.